Upgrades react-scripts to ^1.1.5 to remove an indirect dependency on the [vulnerable package macaddress@0.2.8](https://snyk.io/vuln/SNYK-JS-MACADDRESS-12141). Removes unused dev dependency on `gulp-browserify-thin`. Addresses a security vulnerability that affects `minimatch@2.0.10` indirectly required through this module. [1/4] �  Why do we have the module "minimatch"...? info Has been hoisted to "minimatch"
info Disk size without dependencies: "44KB"
info Disk size with unique dependencies: "64KB"
info Disk size with transitive dependencies: "120KB"
info Disk size without dependencies: "76KB"
info Disk size with unique dependencies: "96KB"
info Disk size with transitive dependencies: "152KB"
Check if `gulp-browserify-thin` is required anywhere, it is not. Cleans up unused website resources from before the migration to Docusaurus, and makes sure static website resources are generated and refreshed at every build. Website loads and pages contain the expected content. Upgrades [react](https://npm.im/react) and [react-dom](https://npm.im/react-dom) dependencies to the freshly released 16.8 version supporting Hooks. Adds claudiopro 's email for TravisCI build notifications. Feel free to do the same if you want to stay in the loop. The flow server's version didn't match the client's, so it exited. Going to launch a new one. Summary: Fixes lint warnings in convertFromHTMLToContentBlocks2 tests and initializes with defaults from the `clear` method. After internal discussion and approval by the legal team, we decided to align Draft.js with other Facebook open source projects [recently re-licensed under MIT](https://code.fb.com/web/relicensing-react-jest-flow-and-immutable-js/). This PR removes the patents grant and re-licenses all Draft.js source files under the MIT license. Clarifies editor example, explaining how to use CSS selectors from the Draft.css stylesheet, changes `height` to `min-height` in example. Improves editor overview example providing a code sample that sets the editor's min height and border, as well as focuses the editor when clicking the editor area. 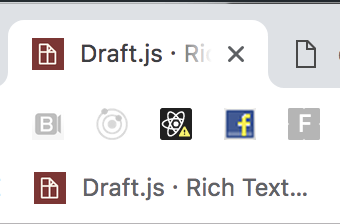 Updates icons and launcher icons to use the Draftjs logo on a maroon backdrop instead of the "D" letter. Fixes a warning in the color examples for missing keys for elements in an array for the style controls. react.development.js:336 Warning: Each child in an array or iterator should have a unique "key" prop. Check the render method of `ColorControls`. See https://fb.me/react-warning-keys for more information.